This established family residence in Power Street Hawthorn had previously undergone renovation with rear additions providing family living, dining and kitchen spaces. These regrettably fell short of providing an agreeable layout and flow for the family, being awkward in configuration, somewhat confined in height and lacking in good natural light. A complete rethink of this space and its relationship to its garden setting was called for. It was agreed the best remedy would be to start afresh whilst generally keeping to the existing envelope so as not to diminish the available garden area and in so doing, provide a more liberating space and focal point for family activity. In its presentation a pavilion style structure seemed most appropriate in offering connection to the garden whilst differentiating itself from the established character of the existing house. In this way both new and existing co-exist harmoniously, equally and proudly representing their own period in history to which they came into being. The scope of work included some modernisation of the existing, along with the integration of the new pavilion with a new raised swimming pool and garden re-work by Jack Merlo, landscape designer. The ‘Pavilion’ as the name suggests, is open and skeletal in form, the material pallet restrained and limited to glass and bluestone clad walling. Timber flooring and bluestone tile terracing. A careful balance of openness and privacy is struck to establish the garden connection whilst being afforded privacy from neighboring properties. 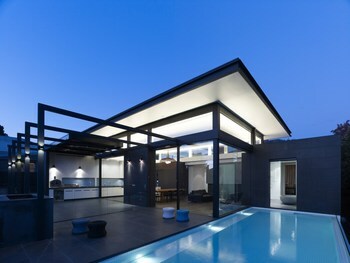 This is achieved through the placement of screen blade walls to its flanks and frameless openings to the garden vista. Subtle indulgences have been included such as the direct access from the master en-suite to pool via an automated glazed door, reinforcing an urban resort feel to the home.